Jason Saves the World: West Fjords Day 2: More Cool Encounters and Puffins! 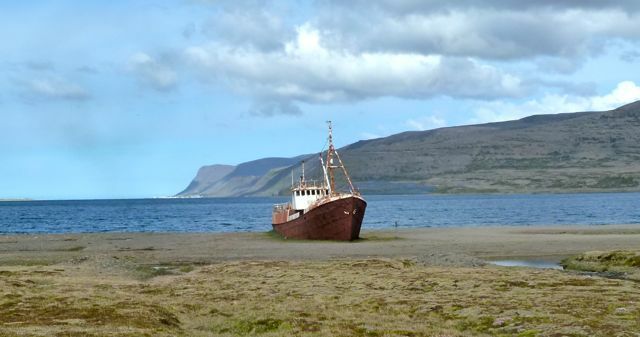 West Fjords Day 2: More Cool Encounters and Puffins! Georg left at 8am to go to work, and we were up shortly thereafter. Something was up with my electric plug so I borrowed Jurate's to charge my camera. With a lot to see and do, we wanted to get moving a little earlier. So we finished our cereal quickly and left by 10am. Our first stop was a hidden hot bath in a small town somewhere in this part of the west fjords. Georg had told us how to get there, and when we arrived we were the only ones there. It was our little secret… almost. One older man appeared and settled in to one of the pools. But whatever - it felt so good to just sit in hot (40-45°C / 105-115° F) water, with the sea on one side and isolated mountains on the other side. 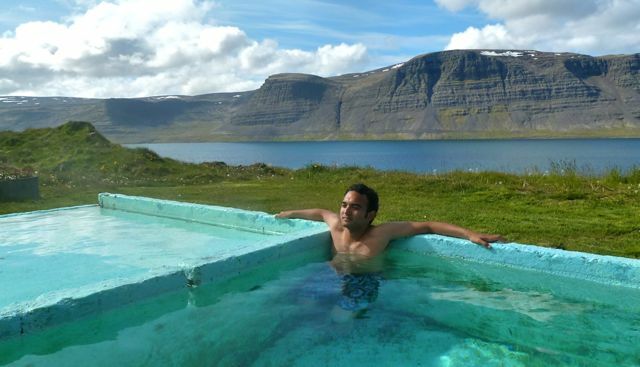 After bathing in the hot pots, my body continued to feel warm and comfortable - I could start every day like this! We drove west, around more fjords and discovering an abandoned iron ship from around 1910. We drove on and found a small café with a US Navy airplane disassembled outside (and also a mock viking ship). The road was gravel most of the way, and our car picked up even more dirt. The car is covered in a solid layer of brown dirt. We continued to Látrabjarg, a lighthouse sitting on a cliff which is the westernmost point in Europe. 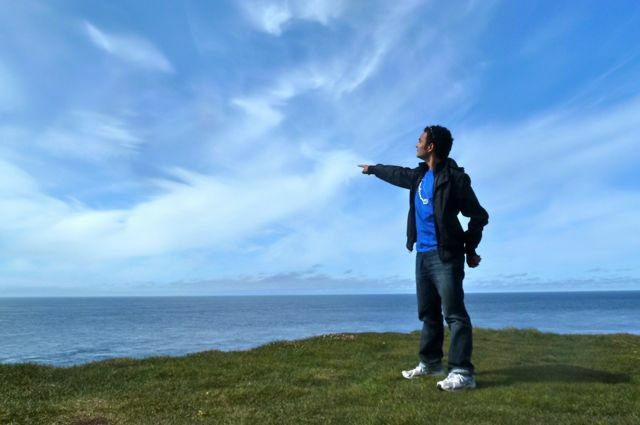 From there a string of tall cliffs stretched for 14km, and these "bird cliffs" are home to thousands of birds, from seagulls to guillemots to razorbills and fulmars. 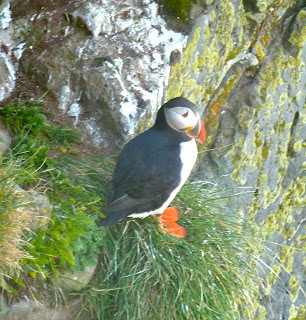 But what we most wanted to see was the elusive symbol of Iceland, the puffin. And we finally did get to see the puffin! There were several of them just sitting at the top of the cliffs, right next to where you could just walk up (being careful not to fall over, it's a long plunge down). 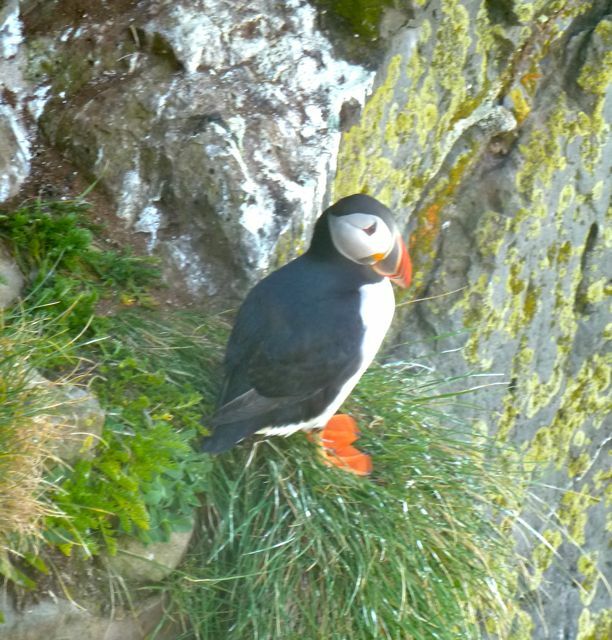 And the puffins didn't disappoint - they are just as cute in person as they appear in pictures. We walked along the cliffs for a bit, seeing lots and lots of birds and stopping to try to see whales (which we did!). We left Látrabjarg, driving back along the dirt gravel roads; Jurate was skidding but I didn't notice as I was drifting to sleep. We then arrived at the ferry terminal, Brjánslaekur, where the ticket terminal was closed, but we saw that the ferry left at 19:00 instead of 6pm, giving us extra time. There were a guy and a girl just sitting outside; we asked them when it would open and they said "5 I think?" With our newfound extra time, we decided to go for food and possibly swim in a nearby heated pool. The two travelers looked sad and lonely, so we invited them to come with us. They were Tim from Antwerp and Ria from Dresden. 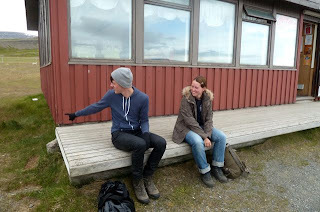 They are both in Iceland for nearly the entire summer (Tim has no end date really), are hitchhiking around the country, and just met the day before. We all went to a restaurant at the hotel in Flókalundur, and then we drove backward to a swimming pool that Georg had suggested to us, but it was oddly closed (we had to call?). The rain was starting to sprinkle as we said bye to Tim and Ria, wishing them well as they tried to get to the bird cliffs themselves. Then we went to the ferry terminal and got on our ferry. Jurate and Nerijus went in to use the toilet, and guess what - they saw Georg's friend Louie, who we met last night! He was taking the same ferry as us. What a small world - but there are so few people in this part of Iceland that it isn't as much of a surprise. 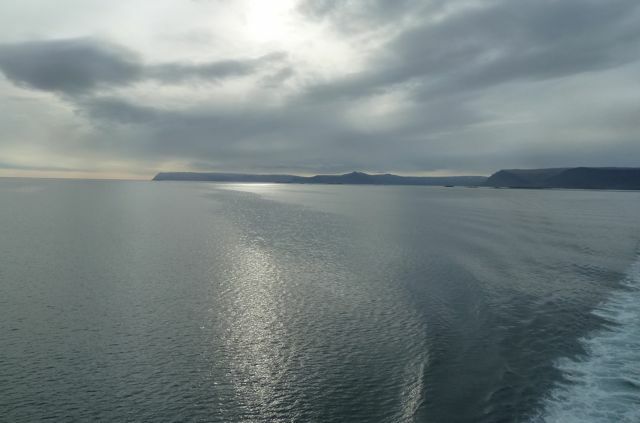 The ferry was smooth, so I didn't even notice it moving, and so I didn't get any hint of seasickness. I updated photos on my laptop. The wind was cold on the upper deck, and there were light showers falling too, but the air was fresh. The ferry stopped for a few minutes at Flatley Island, and then continued to Stikkisholmur, where we drove off and onward to Helgasfjorthur, which is a sacred mountain to some. Apparently you're supposed to walk up the mountain from a heroine's gravestones to her remains at the top, and if you do it in complete silence and without turning back, you will be granted three wishes. So we did this, but we had a hard time finding the gravestone to start at. There were also a couple of very friendly dogs that hounded us (pun intended) as we got out of the car. At the top of the mountain, some sunshine broke through the colds in warm orange rays. We drove on, reaching our hostel in Borganes at the latest of any hostel so far - just before midnight. I made some tasteless ramen.